NEW YORK--(BUSINESS WIRE)--Barnes & Noble, Inc. (NYSE:BKS), the nation’s largest retail bookseller and the leading retailer of content, digital media and educational products, today announced the new NOOK Tablet 7”, the Company’s most affordable NOOK ever at just $49.99. 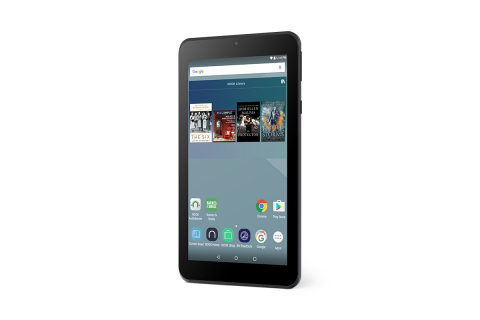 The sleek and lightweight new 7-inch device is a full-featured Android tablet with access to millions of NOOK Books®, thousands of NOOK Audiobooks® and hundreds of magazines and newspapers through the NOOK Store®, as well as full access to the Google Play Store. NOOK Tablet 7” also features front and rear-facing cameras, expandable storage up to 128GB through a microSD card (sold separately), Bluetooth connectivity and a quad-core processor, all for less than $50, making it the perfect gift for everyone in the family this holiday season. The newest NOOK is available at Barnes & Noble stores starting on Black Friday, November 25. The NOOK Tablet 7” is Barnes & Noble’s most affordable NOOK yet, combining the NOOK experience readers love with all the tablet features they need, for the unbelievable price of just $49.99. It features front and rear-facing cameras, Bluetooth compatibility, a soft-touch back, a quad-core processor, and expandable storage space from 8GB to an additional 128GB via a microSD card (sold separately), including the ability to download most NOOK Books directly onto the microSD card. NOOK Tablet 7” runs Marshmallow (Android 6.0) and has full access to the Google Play Store, featuring millions of Android apps alongside a huge selection of games, movies and TV shows. It also features an enhanced digital bookstore experience with B&N Readouts™, which brings the pleasures of bookstore browsing and discovery to the NOOK digital experience, and access to a growing library of NOOK Audiobooks and a huge selection of digital magazines and newspapers through the NOOK Newsstand®. NOOK Tablet 7” also supports NOOK Profiles®, enabling families to customize up to 6 profiles that turn the tablet into a personalized reading and entertainment center. Parents will appreciate the ease of setting up profiles for their children with lots of relevant kid-friendly NOOK content for them to enjoy, while managing appropriate content and access to the NOOK Store. Over 4.5 million books including bestsellers, new releases, classics and enhanced titles with special content, including more than 1 million titles priced under $5. Nearly 80,000 digital audiobooks, including 9,500 free titles. The NOOK Newsstand has a huge selection of the top 100 bestselling U.S. magazines available for both digital subscriptions and single copy sale, and a vast collection of newspapers and magazines. NOOK Tablet 7” comes equipped with B&N Readouts, an innovative feature that brings the pleasures of bookstore browsing and discovery to the NOOK digital experience. B&N Readouts offers a daily selection of addictive quick reads that can be enjoyed anytime and anywhere on all NOOK devices including the new NOOK Tablet 7”,the Free NOOK Reading Apps™ for Android™ and iOS® devices, and at www.bn.com/readouts. Leveraging Barnes & Noble’s vast content catalog and deep bookseller knowledge, B&N Readouts delivers compelling two-minute book excerpts as well as full articles from current issues of popular periodicals. These mobile-friendly quick reads are tailored to users’ favorite genres and subjects and optimized for sharing. A delightful tasting menu for readers of every interest, B&N Readouts is curated by Barnes & Noble’s editors to surprise and delight always-on, on-the-go customers. Plus, through B&N Readouts, customers can join the thousands of NOOK readers on Serial Reads, Barnes & Noble’s popular program of free fiction serials through which subscribers enjoy a new book every month, delivered free in daily chapters directly to their devices. Titles are hand-picked by Barnes & Noble editors across genres and a variety of authors. 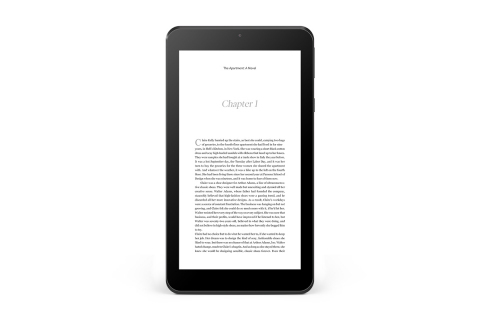 The NOOK Tablet 7” is available at Barnes & Noble stores starting on Black Friday, November 25. For more details, customers can visit BN.com/NOOK or speak with a bookseller at their local Barnes & Noble. All NOOK devices come with complimentary in-store support. NOOK customers can visit any of Barnes & Noble’s 638 stores across the country for free, personal support, including help setting up their NOOK device and organizing their library. While in-store, customers can speak with any of the Company’s expert booksellers, access free Wi-Fi and enjoy the popular Read In Store® program, which allows guests to read any book free for up to one hour per day. Barnes & Noble®, Barnes & Noble Booksellers® and Barnes &Noble.com® are trademarks of Barnes & Noble, Inc. or its affiliates. NOOK®, NOOK Tablet® and the NOOK logos are trademarks of Nook Digital, LLC or its affiliates.